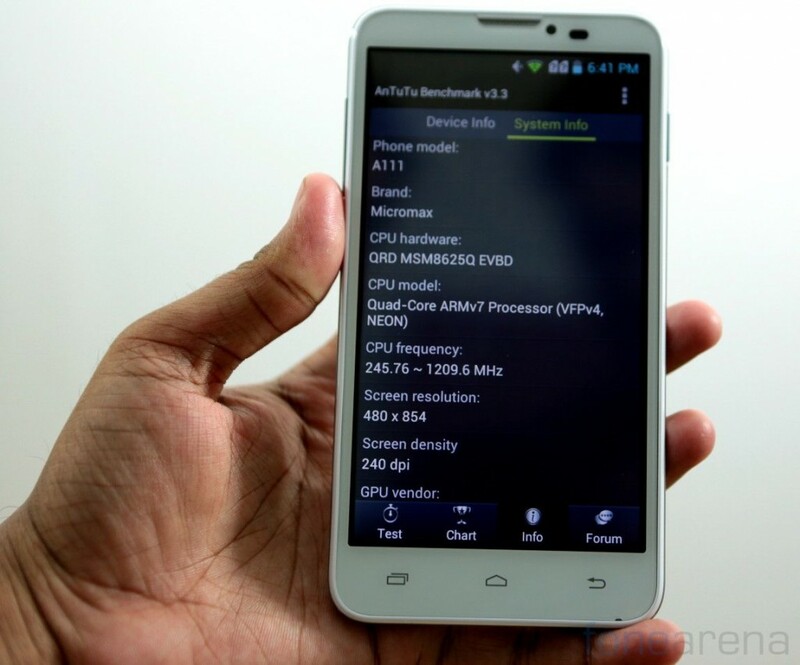 Micromax launched the A111 Canvas Doodle back in May. 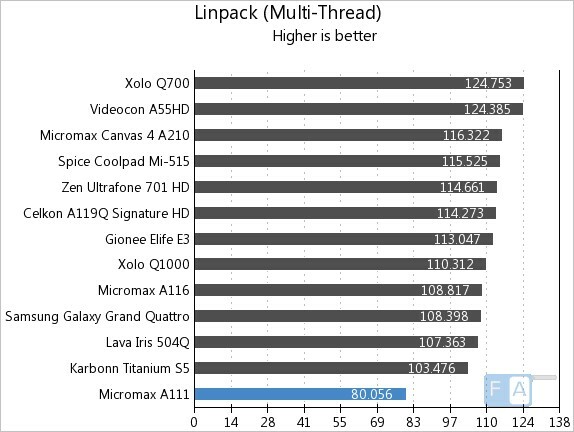 It has a 5.3-inch (854 x 480 pixels) capacitive touch screen display, powered by a 1.2 GHz quad-core Qualcomm Snapdragon 200 MSM8625Q processor with Adreno 203 GPU similar to the Karbonn S5 Titanium and the Samsung Galaxy Grand Quattro, but this one has 512MB of RAM. It runs on Android 4.1.2 (Jelly Bean) and also comes with a free Stylus pen. 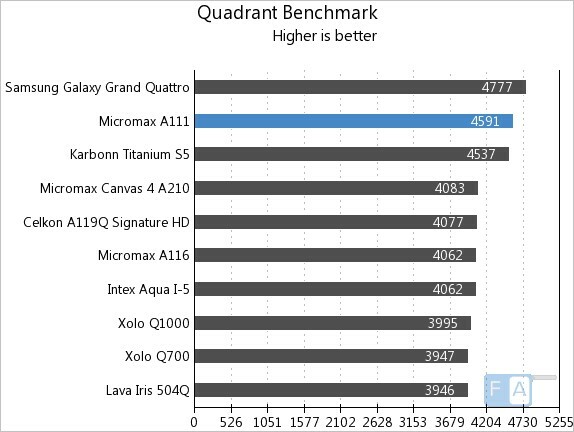 We brought you the unboxing of the device last week, here we have the benchmarks of the device. The Canvas Doodle scores 4591 points and grabs the second spot, just behind the Grand Quattro. 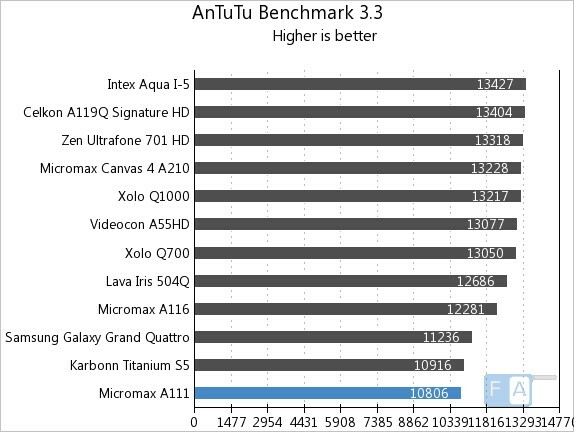 It lies on the bottom of the AnTuTu Benchmark 3.3 with just 10806 points, below both the Snapdragon 200-powered devices. 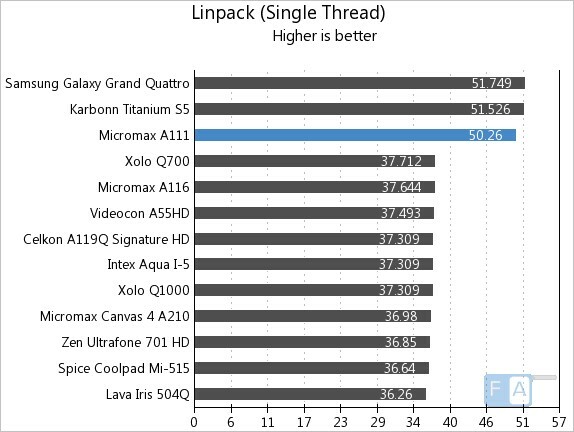 It scores around 50 points in the Linpack single thread benchmark. But it manages to scores just 80 points in the Linpack multi-thread benchmark. This might be due to RAM. 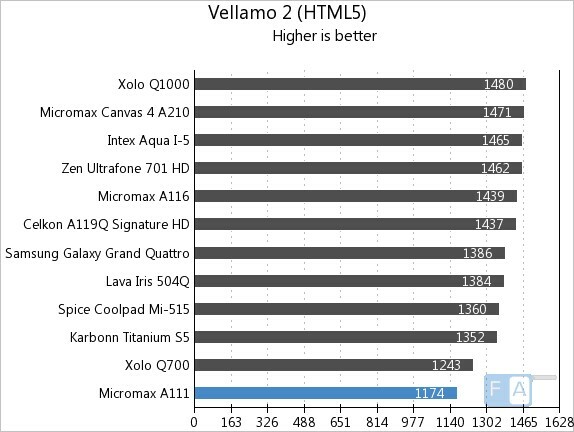 It scores 1174 points in the Vellamo 2 HTML5 browser benchmark. 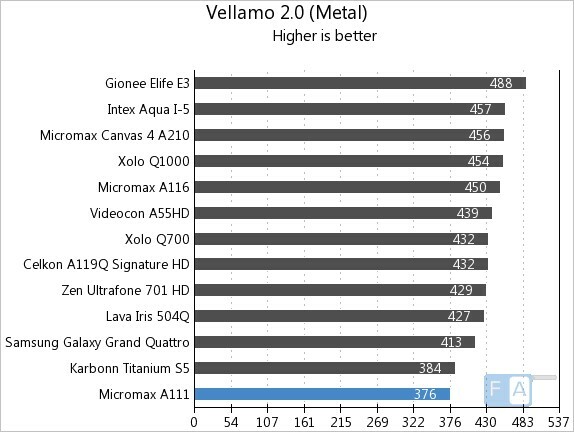 It scored 376 points in the Vellamo 2 Metal subsystem performance test. 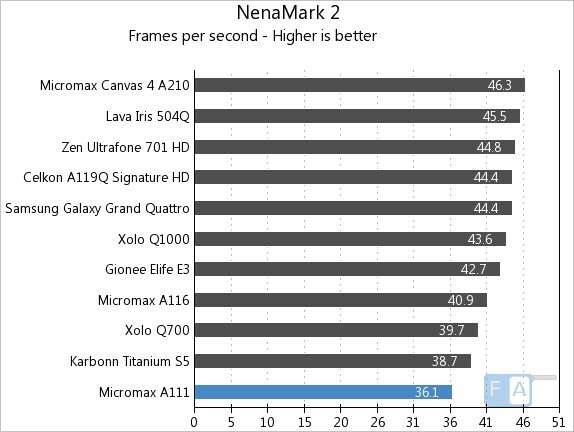 It manages to clock 36.1 fps in the NenaMark 2 GPU benchmark. 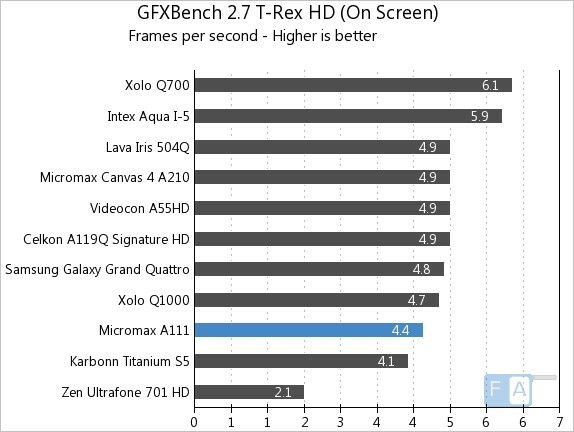 It clocked 4.4 fps in the GFXBench 2.7 T-Rex GPU benchmark. 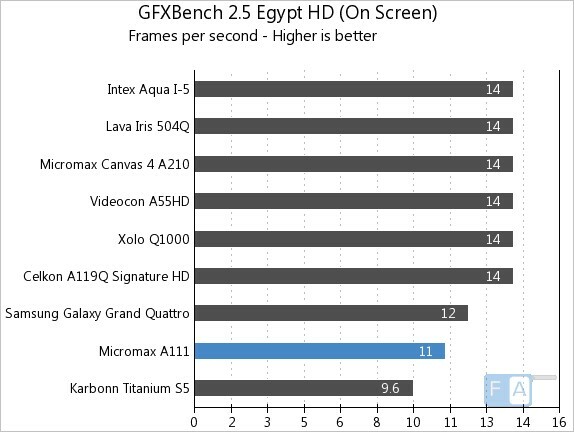 Due to its large screen with low display resolution, the phone manages to score just 11 fps in the GFXBench 2.5 Egypt. Since the Basemark X crashed, we couldn’t get the scores of it. We will bring you the complete review of the device soon.